The Smith family’s incredible road to success started on Cherry Street in 1922 with James Augustus (J.A.) Smith Jr., or "Smitty" in a place called Smitty's Barbeque. 1. The Smith Family’s Incredible Road to Success Started in 1922 With James Augustus (J.A.) Smith Jr., or "Smitty"
Smitty descended from an ancestral lineage of early pioneer settlers in Jones County. Smitty's parents, James (Jim) and Maggie, farmed the family land located in Jones County, in the area of Clinton that bordered what is now Georgia Highway 49 and Gray Highway before buying 1000 acres of land that the Ocmulgee National Monument now occupies. Part of the farm, located on the west bank of Walnut Creek at the old wooden bridge, would be Smitty’s birthplace in 1902. Smitty's first job was that of a delivery boy for a men’s clothing store, then he restored and sold old bicycles. Next, he was hired as a table hop and soda jerk at Max Morris Drug Store located on the corner of Cotton Avenue and Cherry Street. During WWI, Smitty's father purchased a Hudson automobile for Smitty (At age 15, he was too young to sign for himself )to transport soldiers to and from Camp Wheeler and to Fort Jackson in South Carolina. After WWI Smitty went to work at Joseph N. Neel Co., then soda jerked again at Mitchell, Williams and Mack. 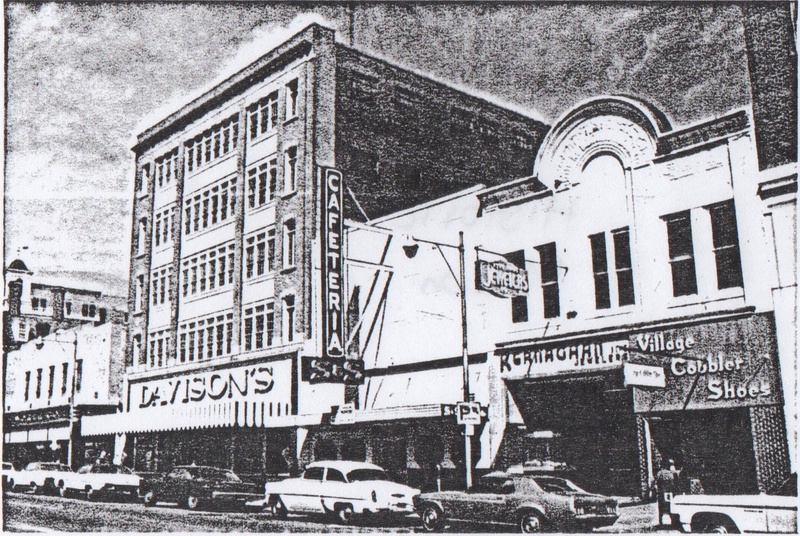 After settling down with his wife Marguerite, Smitty bought a car wash in 1922 on 3rd Street in downtown Macon. One day, while selling car wash tickets, Smitty walked into Lee’s Department Store to chat with Mr. Lee. Being all too familiar with Smitty’s sandwiches back when he was a Soda jerk, Mr. Lee suggested that Smitty get into the food business. Mr. Lee even offered Smitty the small space beside his department store for him to operate his restaurant out of. Smitty opened the restaurant on Cherry Street, naming it Smitty’s BBQ. Smitty’s BBQ was later named "A Hole in the Wall" and this marked the beginning of Smitty’s restaurant career. Needing more space to accommodate customers, Smitty moved his restaurant to a bigger location on Broadway while also opening U-Drive-It, middle Georgia’s first car rental in middle Georgia. In 1929, Smitty opened the Wisteria Restaurant, which was located next to the Ritz Theatre. Then came the Wall Street Crash of 1929 also known as Black Tuesday, however Smitty was able to keep the doors open and survive the financial crash only after his staff agreed to accept salary cuts. After the crash of ’29, times were bad but Smitty continued to own and operate three restaurants; The Wisteria, Smitty’s BBQ and The Waldorf Grill. Smitty then decided to open an additional barbeque restaurant for his parents to operate on the corner of Riley and Vineville Avenue, named The Sawdust Trail. His parents sold the family farm in Jones county and moved to Macon to run The Sawdust Trail, but the building soon caught fire and burned to the ground. In 1936, Smitty opened the first S&S Cafeteria in Columbus, Ga., a second S&S opened in Savannah, Ga. in 1938 and then in June of 1940 the third S&S opened in Macon on Cherry Street next door to Davison’s Department Store. From the moment J. A. Smith Jr. opened the first S&S Cafeteria in 1936, Smith and Sons Foods became a family business. In 1949, Smitty founded State Wholesale Food for the purpose of consistently maintaining high quality food for use in his facilities. This centralized distribution center, located in Macon, Georgia, provides the purchasing of foods and supplies to all S&S locations. The Smith family was among the first to establish this cooperative buying and distribution program and their products are distributed to stores weekly. With eight S&S Cafeteria restaurants across the Southeastern region, two of them being in Macon, there is no surprise to why this business is still flourishing. 78 years and four generations of Smith family involvement later, S&S Cafeterias’ owns and operates locations in Georgia, Tennessee and South Carolina.